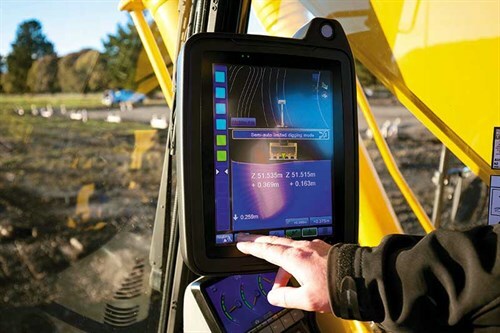 The contractor using New Zealand’s first Komatsu iMC (intelligent Machine Control) excavator is finding its fully integrated system is delivering significant productivity, safety, and cost-saving benefits even when compared with existing ‘bolt-on’ GPS- based excavator indicate systems. 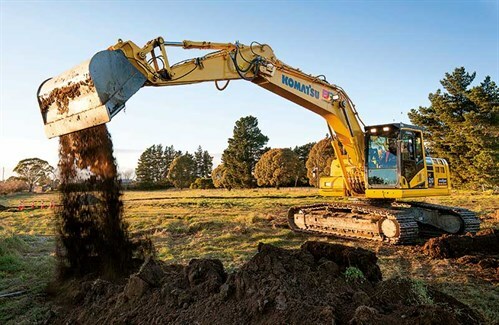 Komatsu’s newly released PC210LCi-10 iMC excavator was purchased by Dunedin- based Clarke Machine Hire—one of the country’s largest Komatsu owners with around 300 Komatsu machines in its fleet—in early April and sent out to work on long-term hire with client BG Contracting. BG Contracting is a civil contractor based in Canterbury and has been in operation for about 30 years. It offers a full range of civil construction services, including greenfield subdivision projects as well as pump station installation and drainage works. The company is a significant owner of Komatsu equipment in its own right, owning half of its fleet and hiring in the other half—pretty much all Komatsu—from Clarke Machine Hire. Its total machine fleet based on its current work levels is around 34 machines. According to Mike McNeil, BG Contracting’s operations manager, the new PC210LCi-10, which he described as "absolutely great", has been at work every day since it was delivered to the company. "We’ve been running conventional ‘bolt-on’ machine control systems for a few years now, and we have two dozers, two graders, and five excavators—all using Topcon machine control," Mike says. "Paul Clarke gave us the heads up that this new excavator technology was in the country and was going to be on display at THE Expo at Mystery Creek, Hamilton in March, so we flew up there to have a look. "We were very impressed with what we saw, and told Paul we would definitely use it. "In the 12 weeks since we’ve had the iMC PC210LCi-10 on site, we’ve found it’s a big step forward compared with conventional GPS-based excavator indicate systems." Mike says the Komatsu iMC excavator was more productive, improved site safety, and meant substantial potential savings in materials costs. "Because you can set up the machine so it won’t over-dig, as soon as it gets to the required level, it won’t dig any further," he says. "That means you are not wasting time and effort digging out material you don’t have to and you don’t need to fill over-dug sections with valuable aggregates or other fill material. "We do a lot of undercuts as part of our road construction activities, and for every 50mm extra you take out, you have to replace it with metal and that gets expensive. "Sure, with a conventional machine control operation, you can set a subgrade, but in undercut work, it comes down to operator skills to avoid over-digging. It’s easy to over-dig if you do it wrong, and if you don’t get it right, it can cost the business a lot of money. "Because we can set the depths we want to cut, you can never over-dig, which is great from a QA and business point of view." "We have to do a fair bit of work under overhead powerlines, and that’s a risk for the operator and those around the machine. "With the iMC excavator, we can set a safe work height within the design so that the machine alarms the operator a certain distance from the powerlines. That’s safer for the operator and it’s peace of mind for us because we know that machine will never come in contact with live wires," Mike says. One big difference the BG Contracting team has noticed compared with other 20-tonne machines is the increased stability due to its longer undercarriage and heavier counterweight. 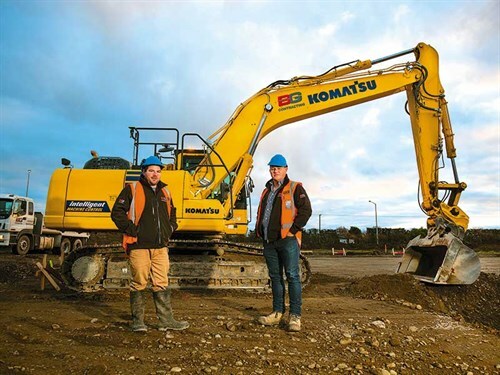 "When you’re working at full reach with machine control, the bucket can tend to wobble a bit, so Komatsu has put on a longer undercarriage and bigger counterweight, which gives great stability. That’s something you really need with this machine because it absolutely can’t move or you lose accuracy." Shortly after arriving on-site, BG Contracting took the opportunity to compare the iMC excavator with a similar-sized excavator fitted with a standard ‘bolt-on’ GPS- based excavator indicate system. The test involved two service trenches, both two-metre wide by 1.2-metre deep, one on each side of a new section of road. "On one side of the road, we had a 20-tonne machine fitted with a Topcon indicate system, and the iMC excavator on the other side," Mike says. "The standard machine achieved 238 lineal metres in an eight-hour day, and the Komatsu iMC got to 352m, so 124m or 48% further. "I think the difference was the iMC operator not having to constantly stop digging and use his bucket to check his depths to ensure he wasn’t over-digging. "As well, the iMC trench was absolutely dead straight and level, while the other one had little ridges all the way along." Mike and the BG Contracting team carried out a similar test when they first introduced a machine guidance excavator some years ago. "Before we got our first GPS system on a 20-tonner, we were averaging 120 lineal metres a day using conventional manual techniques, and we doubled that with the GPS machine. Now with the iMC excavator, we are tripling that. "We have our own survey team who is responsible for getting all our survey designs into the machine, but all technical issues are handled by Komatsu," he says. "And getting a system off the actual factory production line, which is fully compatible with the machine, is a no-brainer. "The cost of the iMC machine is similar to that of a standard machine plus a bolt-on aftermarket GPS system, and in fact, there are savings in setting it up and calibrating it. "iMC is definitely the way of the future. We can see that," Mike says. "BG Contracting is very happy because everything is factory-fitted. This iMC option beats aftermarket for similar cost and it comes with an 8000-hour warranty," he says. "iMC is a good option for us, as the machines are all set up, ready to go, and we are just dealing with the one supplier," Paul says. 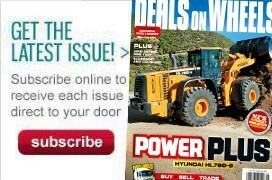 For more information, visit komatsu.co.nz.